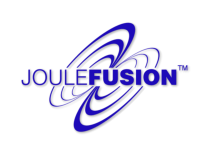 Joulefusion is developing the JF-MG series of non-contact microgenerators that harvest energy from passing conductive surfaces. US and UK patents granted; OEM licensing enquiries welcome. By means of eddy currents, some of the kinetic energy of a passing conductor is converted to electrical energy in the device. The motion of the conductor may be rotary or linear. The motion may be continuous, bi-directional, oscillatory or even transient. For example in the linear example shown above, a conductive target may periodically pass the JF-MG device causing a small packet of energy to be stored on each passing. Available power from the JF-MG series will vary depending upon the size of the device and the nature of the conductive surface and its motion. Maximum performance will be achieved from the high speed relative movement of a copper or aluminium surface.